Fires and haze – how to maintain a glow of interest? Fires in Sumatra and elsewhere are ablaze every year, often causing haze problems in southeast Asian countries. Everyone seems to agree with this observation, and many have asked over the past months and in various media: Why, if this is a recurring problem, has it not been dealt with more decisively? Or, rather, it appears that many were asking this question while the haze was still in the air, but that interest has largely vanished with the haze. 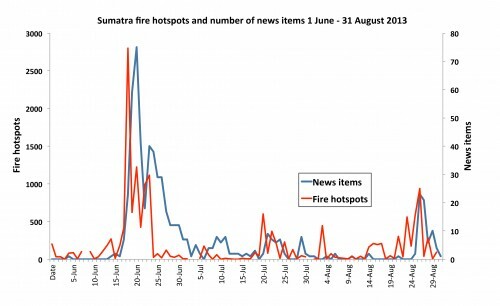 To illustrate mainstream media attention to the recent fires in Sumatra, we compared over time the number of hotspots with the number of related news items over time. The hotspots detected by satellites over Sumatra seem to provide an accurate representation of fires on the ground. We conducted a Google search for news items globally about the fire and haze in Sumatra, and checked each search result manually for relevance. We then plotted the number of hotspots against the 601 news items for the period 1 June to 31 August 2013 (figure 1). There is a remarkable correspondence. From a very low level, the media stories spiked just after the hotspots, and then persisted for about a week after the June peak of fires settled down. Then, in late August, the fires came back, and so did the media reporting – briefly. The flaring-up and fading of mainstream media interest can be a problem in at least two ways. First, in an increasingly real-time and connected world, decision makers are acutely aware of crises-of-the-day that influence the public opinion, but their engagement may not persist when the immediate situation is over and opportunities for deploying longer-term solutions emerge. By then other crises may also have appeared (in the media), that require their full, albeit brief, attention. Secondly, there is a clear bias as to which disasters go viral in mainstream media and therefore become top-of-the-heap concerns in the public and global debate. The priorities seem to be determined by the interests of media itself and build on a sense of ‘newsworthiness,’ which is highest for human catastrophes and environmental disasters – as long as they are tangible, current and provide for selling pictures – like images of children choking on haze. Throw in a celebrity like Harrison Ford and the interest goes up even further. Sometimes, like when reading this NY Times article about the upcoming IPCC report, one wonders if the main purpose is to ensure a continued political squabble, or to focus on the real world matter. Longer-term, slow-change issues with less spectacular scenery attract less interest from media, and subsequently from the wider public. From a long-term perspective, haze is probably not the most important issue about the current fires, beyond the concern of city-dwellers in Singapore (whose concern is very real in terms of financial losses and impacts on health) and elsewhere. The contributions to climate change and loss of ecosystems that the fires represent may in the end have even larger impacts on human well-being. But CO2 is not visible like haze and does not make us choke. Ecosystem destruction has yet to become a significant factor when we buy food in the supermarket. Balancing long-term objectives and immediate priorities is certainly not a new topic. For example, our entire economy is constantly seeking to find that balance – expressed as interest rates. The new connected world comes with constant news coverage at our fingertips, meaning the present is increasingly more in focus than the future. A way to express this is that the interest rate is going up, so it requires more and more effort to successfully engage in our common future. CIFOR is one of many organizations that engage in finding paths to that common future. One of our challenges is to communicate our outputs and generate impact over the long term. On one hand, mainstream media does not provide a consistent platform for this. On the other, science publications are unlikely envoys of change in themselves. Research organizations with an ambition to have an impact must therefore complement their work with their own persistent communications efforts that combine scientific rigor with online and real-time attention. Peter Holmgren is the director general of the Center for International Forestry Research (CIFOR). This post originally appeared here.